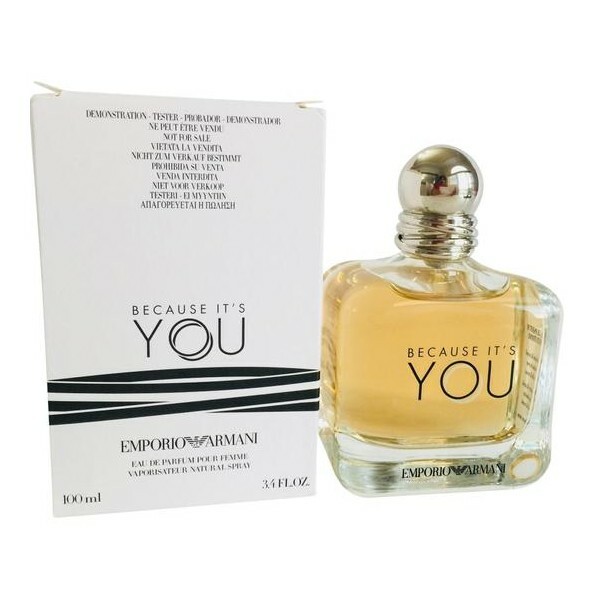 Because It's You Perfume by Emporio Armani, Because It’s You by Emporio Armani was released in 2017, making it a fairly recent addition to the brand’s offerings. It is the feminine accompaniment to the brand’s masculine fragrance, Stronger With You. This particular perfume features top notes of neroli and raspberry. The heart contains rose absolute while the base is made up of musk and vanilla. Emporio Armani is a diffusion brand, divided from the main company, Giorgio Armani. Armani is known all over the world as a premier fashion designer, and the brand has managed to produce over 150 fragrances over the last few decades. Because It’s You perfume was developed by master perfumer, Anne Flipo. She earned this title through International Flavors & Fragrances. She has worked with this company since 2004, and some of her favorite scents include jasmine sambac, patchouli and basil. Become infatuated with this perfume by wearing it as often as possible. Beli Tester parfum original Giorgio Armani Because It's You for Women sekarang, harga termurah di Indonesia! !